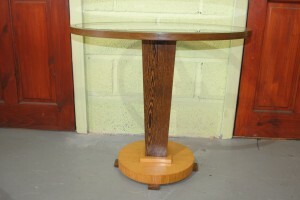 Fantasatic table made from palm wood with a walnut base and glass insert. Great piece of furniture. 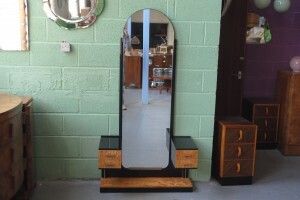 Simple but stunning dressing mirror with 2 sets of floating drawers finished in piano black and satin wood. 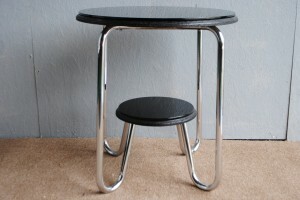 Made by the Rowley Gallery London. Chrome trim and drawer pulls finish this one of a kind piece very nicely. An original Burr Walnut art deco Caplan Dining Suite with Lozenge shape table top and fluted detail that is identical on the matching sideboard and server, even the protective glass tops are cut to precision. Its fantastic when we get suites like this that are all still together after all those years. 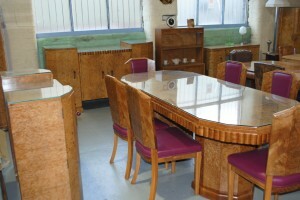 Please look at the photos to see some of the stylish design details of this fantastic art deco dining suite. The colour is more stunning when you see it in person. 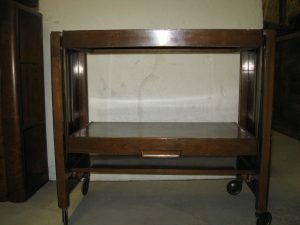 Dark walnut serving trolley which opens up to double size.